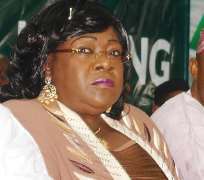 LAGOS—Securities and Exchange Commission, SEC, has given the Director General of the Nigerian Stock Exchange, Mrs Ndi Okereke-Onyiuke a seven-day ultimatum to explain her involvement in the accumulated non-performing loans in the five banks, whose managing directors were sacked last Friday by the Central Bank of Nigeria, CBN. Vanguard gathered that the query might not be unconnected with the N30.9bn non-performing loan of Transcorp of which she is the Chairman. The commission has also directed that all the affected bank managing Directors be suspended from the council of the Exchange. As a result, Dr. Erastus Akingbola who is the 2nd Vice President of the Exchange will have to step down. In a release from the commission signed by Lanre Oloyi, Head, Media Securities & Exchange Commission, SEC said: “ In furtherance of its mandate of ensuring the integrity of the market, the Commission has requested the DG of the NSE to explain within seven days the circumstances under which the name of the company of which she is the Chairman appeared on the list of non-performing debtors to the five banks given the sensitivity of her position as the Chief Executive Officer of the NSE where the five banks are also listed. Apart from the five banks whose suspension was recently approved by the Commission, the NSE has been directed to forward to the Commission, the list of all quoted companies currently on technical suspension, for its review. According to the statement, “the Board of the Commission at its 43rd meeting held on the 19th August, 2009 noted the recent developments in the financial market and affirmed its full support of the action so far taken by the Central Bank of Nigeria (CBN) in sanitising the banking system and has mandated its management to intensify surveillance of the Capital Market and its Operators. “In order to give the new Management of the five affected banks time to settle down and appropriately brief the market, the Commission confirms that it had directed the NSE to place the securities of the said banks on full suspension for a period of two weeks. “Furthermore, in order to protect the integrity of the Capital Market, the Commission has also directed the immediate suspension of any of the affected Executives of the five banks who are members of the Council of the NSE pending the conclusion of investigation of allegations against them by the CBN.